Some of the vehicles in our fleet. 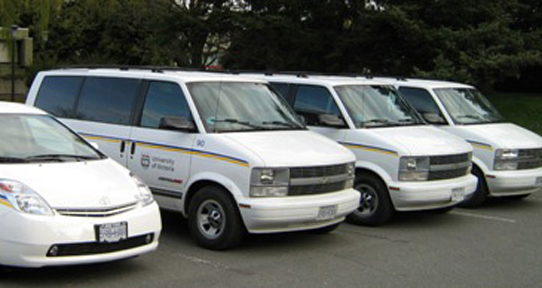 Campus Security Services maintains the University motor pool fleet vehicles. There are a variety of vehicles available for short and long term rentals to UVic staff faculty engaged in University business. Our rental units include 4 Dodge Caravans with seating for 7 including driver and a 1 ton cube van. Rentals are based upon a first come, first served basis. To reserve a motor pool vehicle, please complete this form MP Request/Agreement forms should be scanned and emailed to mprentals@uvic.ca. Upon receipt of the request form our office will provide a confirmation of rental. Any questions, please call CSEC at 721-6386. Charges for the motor pool vehicles are based upon length of rental and kilometers driven. Fuel and insurance are included in the rental charge.